I like this concept because for me it's a much needed guideline. I tend to celebrate special occasions with a range of gifts. I buy something then find something that will be so much better and before you know it, I have a pile of gifts. Limiting myself to a smaller number with a purpose is exactly what I need. The girls immediately fell in love with their Jellycat stuffies. I presented the stuffed animal to each baby separately and sang happy birthday. Spice got hers first. As I turned to start singing to Sugar, she hugged her giraffe really tight, smiled at me and said "thank you mummy". My heart melted. That moment was worth a thousand giraffes. Ever so often, I "meet" a blog that inspires me; one of those is Krissy's B-Inspired Mama and today I have the priviledge of guest posting over there. Do check it out. I especially enjoy her "Mama Knows Best" series which showcases wise nuggets from experienced parents. Since I have kids in twos, I have wisdom-sharing moments in twos as well. Samantha from Cherry Pie Twins asked me to contrubute to her "Twin Moms Wisdom" post. It's a must read if you got twins and enjoy the idea of staying sane. Pop on over and have a good read! PS: I just survived a 4 hour flight alone with 2 year old twins! I got lots to share over the next one week. Taking cupcakes to the daycare was a big part of my 2nd birthday party plan for the twins. Unfortunately, the daycare informed me that some parents had complained about their kids being given cake so birthdays had to be celebrated with fruit. Bummer! Time to change plans. I considered Edible Arrangements but their products would be better appreciated by adults. Next option? 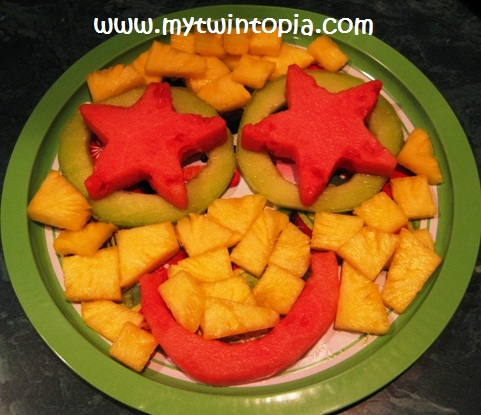 Fruits by mommy. Ha! 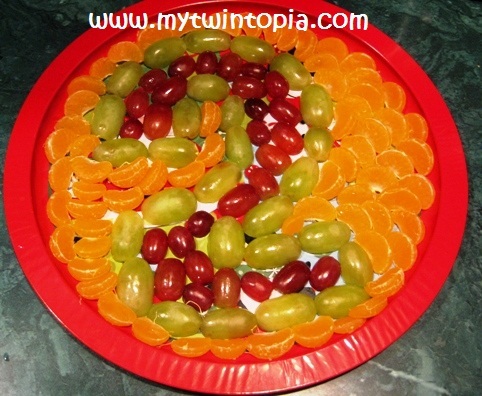 After some consultation with google and Pinterest, I decided to make 2 fruit trays - one for each birthday girl. 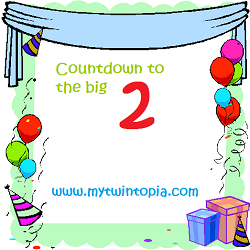 "2". The tray is named "2" because it was a "2" written in red and green grapes and surrounded by segments of mini-oranges. Second tray is named "it's-midnight-and-I'm-sick-and-tired-of-cutting-and-eating-fruit-and-I-can't-believe-that-darn-seedless-watermelon-is-full-of-seeds". I know that's quite a mouthful so we'll just call it "fruit tray" for short. It's honeydew melon rings plus star-shaped watermelon pieces and pineapple pieces. If you squint while looking at it, it sorta looks like a smiling face. My heart is too full and all my words feel too empty for me to write a halfway decent post. In a few days, my princesses will be 2 years old. I’m all sorts of nostalgic and overwhelmed. Where did the time go? Where did my babies go? And who are these very opinionated young women living in my house rent-free? My Project 52: To take a photo of the girls every week of their second year and put a photobook together. Looking through those photos brings so many poignant memories like the first visit to the park when they were terrified of going up the slide, the second visit to the park where my confident daredevils insisted on going on the big kid slides (and messing with mommy’s blood pressure). I"m missing photos from 4 out of the 52 weeks so I feel quite good about this. Shopping our closets: I started reaping the dividends of buying the girls clothes a year or two ahead on clearance and off season. Whenever their wardrobe was starting to look old, I just indulged in some retail therapy via the totes full of new clothes. Teaching the girls their numbers and new words and saying "Amen" after bedtime prayers and saying "please" and "thank you" and "all done"
Discipline: I haven’t fared well with having an effective discipline tactic yet. In fact, my failure fills my ears almost everyday… you see, a few months back Spice wouldn’t stop cry-whining. She went on and on and on and finally I got on my hunches, looked her in the face and said STOOOOOOOOOOOOOP! It didn’t make an impression on her but it did on Sugar. The next day, I was listening to the girls waking up in the morning. Spice started crying for me and her milk and from across the room I heard Sugar yell STOOOOOOOOOOOOOOOP! I was instantly mortified and ashamed. Of all the things she should pick up from me so fast, it had to be that. She’s been doing it ever since – yelling STOP if there’s something going on that she doesn’t like. I do appreciate having a daughter who knows to yell “STOP”; it’s a good skill to have in my opinion. I just wished she had learnt it from my good example not my bad. 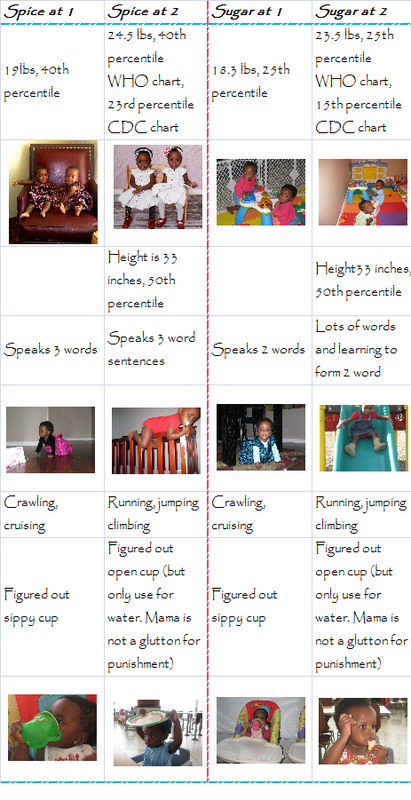 Tantrums, a month long battle with toddler diarrhea, several crib escapes… all in a year’s work! Clothes, paper and toys! The 3 banes of any home with young twins. I’ve already sorta developed systems for taking care of excess clothes and organizing paperwork. The toys were the last (very daunting) frontier to be conquered. Our last month’s home move was my opportunity to finally organize the twin’s toys. 2. TOY POLICY AND VISION: Once I stopped buying and gave myself a breather, it was time to define my toy policy. This will be my guideline for all future toy acquisitions and definitely is not a one-size fits all. For us, the toy vision I have is avoid battery-operated toys with all the obnoxious lights and sounds when possible. I want toys that encourage the girls to do more than just push a button. d. SHELF the toys that the girls do not seem to have grown into. The Megabloks fall into this category. We’ve owned them for almost a year now and the girls have shown little interest in them. They are on a top shelf hidden away for now and I will bring them out again in a couple of months. If the girls still show no interest, they will be moved to the DISOWN pile and I’ll call it a day. 6. ARRANGE the toys in the respective play areas. The living room toys are all toys that won’t prove to be a nuisance should we be entertaining guests while the girls are playing in the corner. 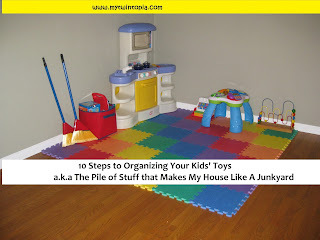 Play kitchen, cleaning set, drum, xylophone and bead maze are the living room toys. All the other toys are upstairs in the family play room. This is a work in progress but at least now that there’s a plan in place I can lift the buying ban in step 1 and start “intentional” toy acquisition. Disclosure: The living room corner looks all pretty like that because I just set it up. That tidiness is so 30 days ago :). According to the parenting experts, stacking blocks is a developmental milestone for children between the ages of 1 and 2. So like any parent who spends far too much time on Babycenter and parenting blogs, I bought my twins a set of nesting/stacking blocks just after their first birthday. They chewed on them, kicked them but would not stack ‘em so when it was time to move in February, I conveniently forgot to pack the blocks. 2 months later, I repented and bought another set of blocks and these ones had a “Cat in the hat” theme. Surely NOW the girls would stack ‘em like smart babies are supposed to do? No! They threw them, stood on them (and fell off them) but would not stack them. I was not impressed and decided that stacking was just one skill my girls were not interested in developing so when I got a chance to review a free Green Toys Build-a-Bouquet , I wasn’t expecting much. Straight out of the box, the girls couldn’t figure out how to stack the pieces so I had to give them a demonstration. Quite a bit of fine motor skills is involved in putting the pieces into each other and initially the girls struggled with this and there were some tears of frustration. 15 minutes later, we had our first flower bed built and I showed the girls how to take the flowers apart and store them in the box. Game over for the day?! No. Spice went back and spent the next 20 minutes building her own flower tower. I was so impressed that I pushed back bedtime just to watch her play. Disclosure: I got a free Build-a-Bouquet playset for review. This mama loves her freebies, but they do not influence the content of my posts.